according to the first investigation of fish catches from space conducted by University of British Columbia scientists. Weapons-grade uranium isn’t the only thing Iran may be hiding. The country does not report its fishing catch to the United Nations, which is problematic given that the Persian Gulf, like other areas of the world, suffers from overfishing. But thanks to Google Earth, scientists now know that Iran hauls in more than 12,000 tonnes a year from 728 weirs, large structures built in intertidal zones to trap fish. In a first of its kind study, scientists at the University of British Columbia in Vancouver used Google Earth images to calculate how much fish was actually caught by Persian Gulf nations compared to what they reported. The result: The official numbers are nothing but one big fish tale. 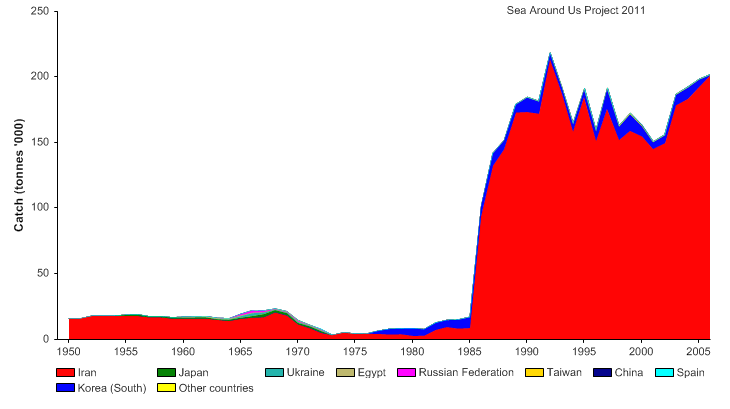 Researchers Dalal Al-Abdulrazzak and Daniel Pauly estimated the fish catch in 2005, for instance, was 31,433 tonnes, six times what nations bordering the Persian Gulf reported. “Our results document the unreliability of catch data from the Persian Gulf, a small part of a global misreporting problem,” the authors write in the study funded by the Pew Charitable Trusts and published in the ICES Journal of Marine Science. “Underreporting fish catches can jeopardize a country’s food security, economy, not to mention impact entire marine ecosystems,” Al-Abdulrazzak told Quartz in an email. It’s just the latest use of Google Earth satellite images to monitor environmental destruction, such as illegal logging in remote locations. Similarly, the researchers say Google Earth can be used to detect illegal fishing and underreporting of fish catches. To give some “ground truth” to the Persian Gulf’s fisheries take, Al-Abdulrazzak and Pauly studied Google Earth images from 2005 to 2010. Unlike fishing boats, weirs are big structures—as long as 321 meters (1,053 feet)—that remain anchored in place and are easily detected by satellites. The researchers spotted 1,656 weirs in 2005. But after running an algorithm to correct for poor visibility, they estimated there were actually around 1,900 weirs. Locations of Persian Gulf weirs. The scientists used a Google ruler tool to measure the size of each weir’s traps and then calculated daily fish catch based on historical records, the length of the fishing season and composition of fish species, such as mackerel, crab, lobster and sardines, at each location. Half the weirs belonged to Bahrain, giving that nation 54% of the Persian Gulf’s estimated catch. Bahrain’s actual catch was 142% higher than what it reported to the United Nations Food and Agricultural Organization, according to the study. Iran accounted for 37% of weirs and 39% of the region’s fish catch. At least one nation was more or less honest. The researchers found that the estimated catch for Kuwait was within 300 tonness of what it reported to the UN. The longest straight line you can sail on Earth ?